There are so many delicate areas in babies’ body that makes them more vulnerable to injuries in crashes than normal adults. Apart from their soft and tender skin, they still have very tiny fragile bones and their spines are still very tender and immature, in addition to their heads being too big for their little bodies. This is why they should never be allowed to ride facing forward. There have been several reports of parents losing their little ones even in a small crash. And most of the time, it’s usually because of a wrong sitting position. When an infant sits facing forward in a moving car, a little crash or even an aggressive halt may result to the stretching of the spinal cord which could cause a serious injury or even death. Trust me! However, when he seats facing the rear, his upper body is cradled by the back of the car seat offering enough protection for the infant in the event of a frontal crash. So it’s advisable not to seat a kid facing forward until he’s old enough to seat that way. The infant-only car seats are specifically designed for kids still at infancy and are not meant to be used by older kids. 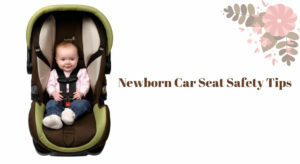 They are usually set rear-faced with weight limit normally between 22 – 40 pounds depending on the make of the car seat. They are usually smaller than other types of child car seat and also highly portable. These feature a carrying handle and a detachable base which is usually left in the car. Kids normally outgrow this type of car seats when they are 2 years old or whenever they grow beyond the height or weight limit. In some cases, this might happen when the kid is only 9 months old. In other words, parents who use an infant car seat should always switch to a convertible or all-in-one car seat once their kid outgrows the infant seat. Convertible car seats usually have a higher weight limit than infant car seats, which may be between 40 – 60 pounds. They are called “convertible” because they can be used in both modes – rear-face and forward-face. They usually start out in the rear-facing position, but later switched to forward-facing mode as soon as the child outgrows the former position. Although these seats will save you the cost of purchasing another seat when your child is older, some of them are not as secure for newborns as the infant car seats. The all-in-one car seats are just like the convertible seats except that they can also be transformed to a booster seat; which is a big plus. However, they are also the biggest type of child car seat available and are usually less portable than the other options. 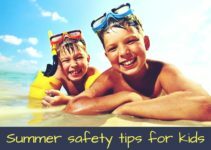 Apart from purchasing the right infant car seat and installing it properly, there are certain things you have to learn to keep your kid safe and ensure he has a fun ride. Below are some important newborn car seat safety tips you can apply to keep your precious little one secure and comfortable. As earlier indicated, the first and probably the most important safety tip you should apply is to seat your baby in a rear-facing position until he’s 2 or until he attains the height or weight limit specified by the car seat manufacturer. Most infant seats that are rear-facing usually have a weight limit up to 35 lbs. Sometimes, this might be more depending on the model or manufacturer of the car seat. Make sure you use only inserts that come with the child safety seat. 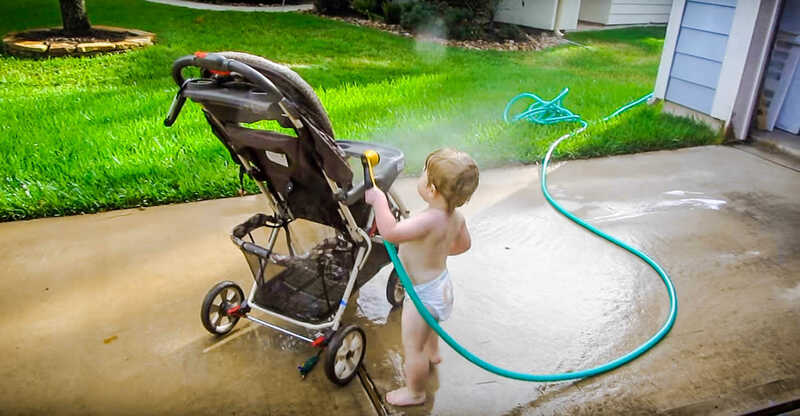 Using something different will not only void the product warranty but could also endanger your child. In case you have a newborn, you can use the seat support or a blanket to keep him from slouching. Sometimes, it may appear that your child’s leg is a little longer the safety seat causing it to bend at the knees. There’s absolutely nothing wrong with this and you don’t have to worry about any harm coming to his knees or feet. The child safety seat should be installed at the back of the car to avoid severe injuries or death in the event of an accident. This is because having a child ride in the front position can lead to collision with an air bag whenever there’s a crash; which is obviously too much for a kid to handle. When installing the safety seat, make sure the shoulder straps is not above your kid’s shoulders. It’s should either be positioned at or below the shoulders. Also, endeavor to position the clip on top of the chest at armpit level. 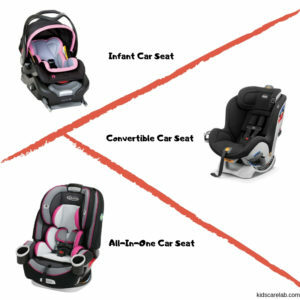 Choose a baby seat that has harness slots in various pairs. This will enable you tweak the harness to fit your baby’s development and growth. Also to make sure the tightness of the harness is not affected, avoid dressing the child in bulky clothing. To ensure your kid’s comfort, you might want to place a towel between him and the crotch strap. If you’re using a rear-facing infant seat, make sure there’s a clearance of at least 1 inch between the top of the safety head and the top of your child’s head. Anything smaller is an indication that your kid has outgrown the chair; so you might want to switch to a forward-facing infant car seat. As earlier indicated, if you plan to ride with your kid, don’t dress him in bulky outwear such as a snowsuit or jacket. Instead, you can use a blanket to cover the child. Make sure you set the infant car seat at an angle of 45-degree using the indicator or angle adjuster that comes with the restraint. This will help to prevent the kid from sliding through the straps. Finally, it’s not only your baby that should be strapped in – you can also attach the toys to engage him while you concentrate on the wheels. Make sure the toys are soft so your pumpkin doesn’t get hurt whenever there’s a stop short. There you have it – newborn car seat safety tips to keep your precious little one secured. There’s nothing more comforting than being on the wheels and knowing that your kid is safe and comfortable. Let us know if there’s any tip you know about that was not listed here.